Donkey Kong sure has quite the legacy behind it today. Not only does it stand as the breakthrough performance of Nintendo as a video game giant, but also as the origins of both Super Mario Bros. and Donkey Kong and being one of the earliest examples of the platform genre. There’s a lot of reason to really remember this game. And can you believe it was originally conceived as a Popeye game? Good job the rights fell through on that one really; as far as Nintendo’s history goes this game is the most prized gem of the bunch. However that’s not to say the formula has stood the test of time. Neither Super Mario Bros. nor Donkey Kong bare much resemblance to this game any more with both embracing new guises through their own separate series and nowadays the two aren’t really seen together in a game unless some kind of sport or competition is involved. 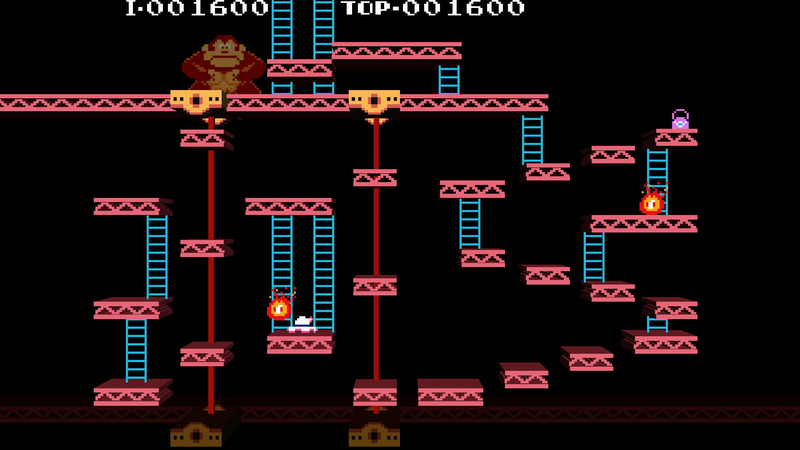 Despite receiving two Arcade sequels in the years following its release, Mario soon exploded into stardom with Super Mario Bros. in 1985, which stands as the starting point for what we consider to be modern day Super Mario, and poor Donkey Kong despite a Game Boy revamp in 1994 had been left hanging in the shadows while his son Donkey Kong Jr. took what little spotlight was left open from the Mushroom Kingdom. That is until Rare developed Donkey Kong Country in 1994 which began Donkey’s, alongside a whole family of Kongs, into their modern day series. 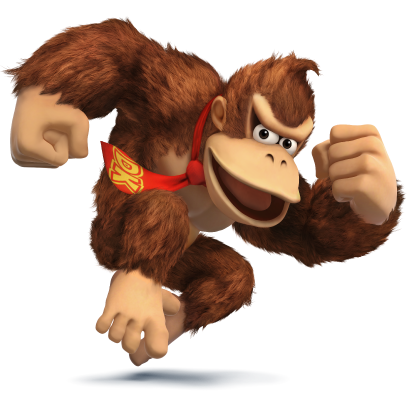 Donkey Kong Country also retconned the characters so that the original gorilla causing havoc atop construction sites was now the cantankerous grandfather Cranky Kong, and the Donkey Kong we know today is in fact an entirely new character. It is these two games that marked the beginning of what we now recognise as Mario and Donkey Kong, but it’s important to remember that their universes began in very different circumstances. There were no heroes and villains originally, only two rivals (Mario was of course the villain in the 1982 sequel Donkey Kong Jr.) who didn’t quite get along. As for our leading lady Pauline, well with a Princess Peach in the world, she was all but entirely forgotten. They are friends now… Honest! This is until Nintendo began the Mario vs. Donkey Kong series in 2004. Considered a spin-off of both universes, the game picks up where the Game Boy title left off and continues the formula to this very day. 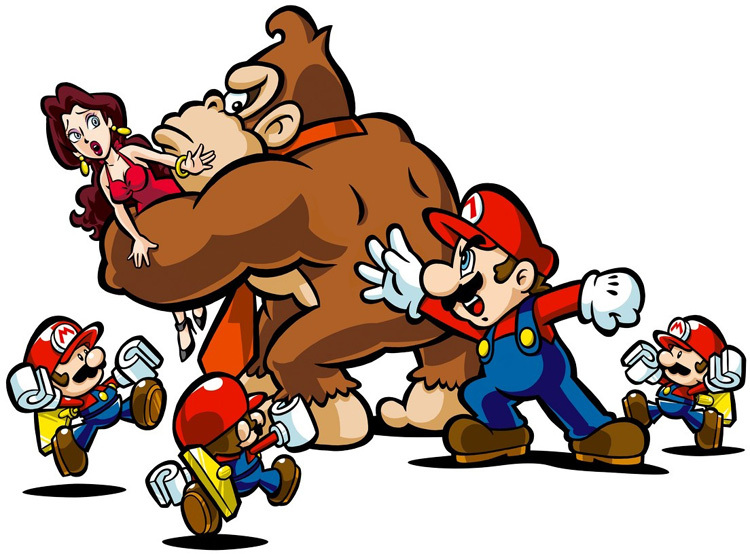 Pauline finally returned in the sequel March of the Minis in 2006 and ever since the three have become firm friends despite the odd disagreement. It is also stated in one of the manuals that Pauline and Mario are merely good friends leaving the plumber’s true love interest safe from competition. Although Peach is noticeably absent from this spin-off series… Regardless, while both Mario and Donkey Kong have changed in their 33 years of being, and gone onto projects much bigger than their humble debut, it is nice that the original formula, which can still be enjoyed today, is alive in the world of Nintendo. Donkey Kong truly is one of Nintendo’s masterpieces and whether we’re still playing it in another 30 years’ time or not, that status shall never be revoked, for without it we’d never have Mario or Donkey Kong to begin with. And without those two, would there even be a Nintendo at all. Check out my overview earlier this week to see how I got on playing the game in this good old year of 2014. 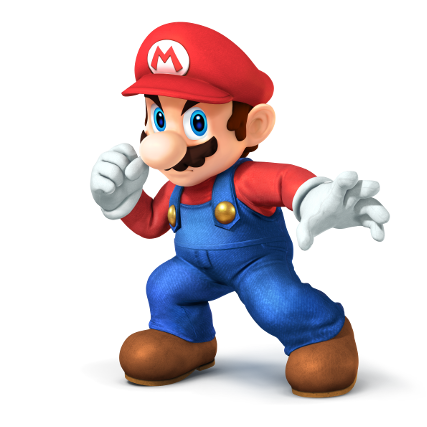 Within Super Smash Bros. the universes of Mario and Donkey Kong originated here as did the Fighters of the same name, both of which have been featured in every game in the fighting series. A Stage based on 75m, the third level of Donkey Kong, is also featured in both Super Smash Bros. Brawl, and the latest Wii U instalment. The Hammer that Mario uses to smash Donkey Kong’s barrels has also appeared as a formidable Item in every Smash game. November 27, 2014 September 26, 2016 p4ratchetArcade, Donkey Kong, Mario, NES, Nintendo, Platformer, Smash Vault Articles, Super Mario, Super Smash Bros.